Half way point for our interns! 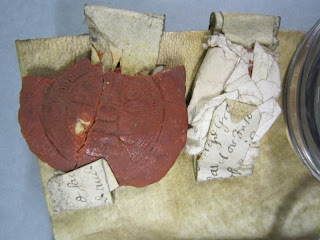 Since the last blog I have been busy researching about the nature and treatment of parchment. I have been nosey and contacting other conservators to see what treatments they use. People have been incredibly kind and helpful in sharing their knowledge and I feel I am a lot more prepared for the treatment stage! While documenting paper items I realised that the potential iron gall ink might cause issues for standard treatments. This wasn’t an area I had expected to research and makes for an exciting extension to the project. This week I have started surface cleaning some of the paper documents, and already you can see a result. 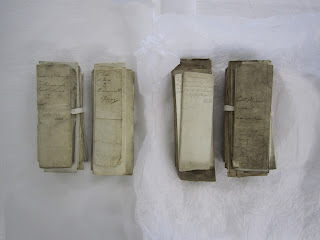 Alongside project work I have been involved with other activities at the Archive. On Wednesday Fiona and I attended a disaster salvage training session which was really informative and included a fun practical session with wet items. At the moment I am preparing for a practical conservation training session I will be running for four volunteers which I am really looking forward to. Next time I hope to show you some more practical work; I have a lot of plans and I can’t wait to get started. Since the last joint blog I am happy to tell you that I have finally completed my box list inventory of the photograph collection. This morning I have been designing a new database for the photographs, and I am now about to embark on the task of creating catalogue entries for all of the items, and then rehousing them in the brand new boxes and sleeves we have just ordered. But it has not all been about inventories and ordering boxes. Over the past five weeks I have: gained knowledge about the medical history of Edinburgh, attended a lecture about the attitudes to the female insane, learned how to repair tears and surface clean documents (thanks Charlotte!) and what to do should a disaster occur in the Archive. I have been really enjoying myself so far on this internship and on my next blog I hope I can tell you about how I’m getting on with cataloguing and rehousing the photographic material. We’re still having a great time. Keep following our individual blogs. As I become further involved with the cataloguing of Norman Dott’s case notes, I’m becoming more and more interested in the diagnosis methods that he used. Dott frequently employed three techniques to aid diagnoses: ventriculography, angiography and electroencephalography (EEG). I’m going to start by looking at ventriculography, because it is perhaps the most unfamiliar to modern ears. 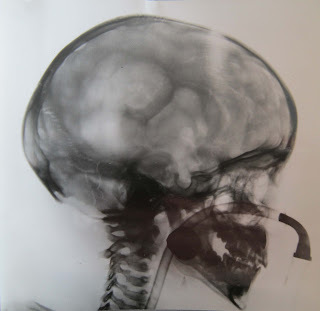 Ventriculography was an x-ray technique used to diagnose suspected lesions in the brain or conditions such as meningitis or encephalitis (inflammation of the brain tissue). Developed by American neurosurgeon Walter Dandy (1886-1946) and used from 1900, ventriculography involved drilling burr-holes into the skull of the patient under local or general anaesthetic. Using a needle, cavities in the brain called ventricles were then tapped, removing the cerebrospinal fluid (CSF) that they hold. CSF cushions and protects the brain, reduces pressure by keeping the brain buoyant, takes away harmful substances and transports hormones and nutrients. Oxygen was then injected into the ventricles to replace CSF in order that any abnormalities could be seen more clearly on an x-ray. In a 1930s’ case described by Dott as a ‘difficult diagnosis’ (but of ‘great interest’), a boy was operated on for hydrocephalus, or a build-up of CSF in the brain that causes dangerous pressure. However, whereas hydrocephalus was undoubtedly present, events after this initial surgery pointed to the possible presence of a tumour. By carrying out ventriculography, Dott was able to detect a glioma (a tumour arising from glial cells that support neurons in the central nervous system) and to operate immediately to remove it, saving the boy’s life. Photograph of ventriculogram, 1936 (LHB1 CC/20/PR1/1215). The tube provided the patient with oxygen during the operative procedure. Dott described the ventriculogram in this case as showing a ‘slightly distended third ventricle beautifully outlined’ and a ‘slightly distended lateral ventricle displaced to the right’. However, the ventriculogram also exposed another anomaly, which turned out to be the cyst of the glioma tumour, causing Dott and his team to operate straight away leading to the boy’s eventual recovery. 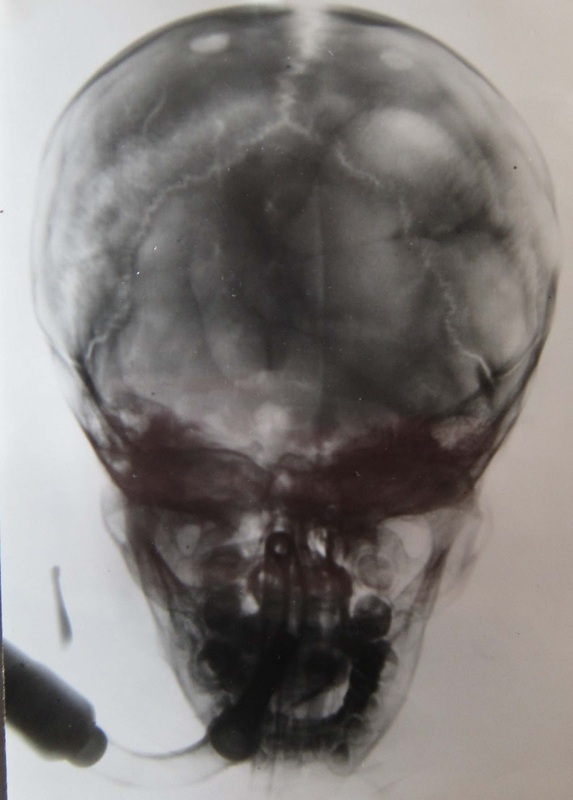 Photograph of ventriculogram on the same patient, 1936 (LHB1 CC/20/PR1/1215). On account of its invasive nature, this form of ventriculography is no longer used in the diagnosis of brain disorders. Magnetic Resonance Imaging (MRI) scans and Computerised Tomography (CT) scanning are currently used in clinical practice, after being introduced during the 1970s. Today Fiona tells us how she's been getting on during the first three weeks of her internship with LHSA. I cannot believe that it has been three weeks since I started this placement! The time has just flown by and it is now my turn to tell you about my progress on this project. An unconventional use of a surgical theatre. Since the start of my internship I have been trying to get a good idea of the photographs I am working with. I have started this project by creating a basic inventory of what’s inside each of the boxes to make it easier for myself to plan how to arrange the records when it’s time to catalogue them. It is not long before we will be discussing the number of sleeves and boxes to buy for the collection. To be ready for this, I have spent the past couple of days measuring the photos in the collection (if you had been in the office, you may have confused me for a seamstress sitting in the corner with a tape measure round my neck!) I have added a couple of photographs from the collection which have stood out for me. If you follow us on Facebook, you would have seen the wonderful one of “doctors hard at work” the other week. A very stylish surgery department from 1912. Speaking of surgery, I felt like a surgeon this week after receiving an excellent introduction to paper conservation by fellow intern Charlotte. I have been trained in how to surface clean documents, repair tears and make my own sleeves using a range of implements! preparing to repair a tear. a great amount of concentration needed! I have learnt a lot these past couple of weeks and I am enjoying the experience a great deal! The next time I write a blog, I hope to tell you more about what the collection contains and how it will look once it is completed. After two weeks at LHSA, I have settled in and my internship is well underway. Having had a good look at the 10 boxes containing material relating to the administrative history of the Royal Infirmary of Edinburgh, I’ve been able to document exactly what the collection includes. I can now work with Ruth and Laura to prioritise items to be conserved and this will help me to make a structured work plan. Having looked at all the parchment items in the collection, I’ve now got a good idea about the main conservation issues which really helps direct my research. The damage that has occurred to wax seals on a lot of the title deeds gives me another avenue of research which I hadn’t originally considered. I’m looking forward to hopefully finding some solutions to help stabilise the seals. 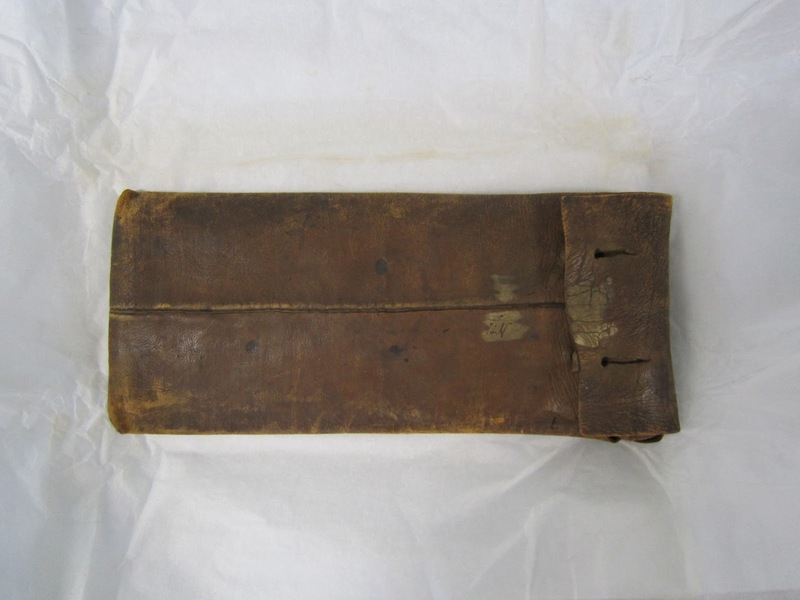 My next steps are to carry out a more detailed condition survey of the parchment items, and to start treating some of the more straight forward paper items in the collection. Alongside the project I’ve been involved with other activities…with Laura I was able to have a little look at cataloguing, and then got involved with a public enquiry. This was really fascinating; and we were able to answer a query from someone searching for records of a relative. Louise introduced us to her work cataloguing LHSA's Norman Dott case note collection, the scale of the project is huge and I have great admiration for the work she’s been doing! With additional seminars, and a great photography session with Stephen, it’s no wonder my first two weeks have gone in a flash! This week’s blog focuses on the early years of radiology in Edinburgh. William Röntgen discovered x-rays on 8 November 1895. By 1898, the ‘Medical Electrical Department’ had opened in the Royal Infirmary of Edinburgh (RIE), housed in a former splints store and plumbers’ workshop, to make use of x-rays to diagnose patients. At this time, the person in charge of the department was called a ‘medical electrician’ and the first person appointed was Robert Murray Milne, assisted by Dawson Turner. Turner took charge from 1901, when Milne became a gynaecologist, and continued in the position until 1911. The Department moved to larger premises in 1904, to the basement of the South East ward block of the Surgical House. By 1920 however, with treatments as well as diagnostics being carried out, the accommodation and equipment became inadequate and a new building was planned. The hazards from short and long-term exposure to radiation had become known during the pioneering decades of work using x-rays, therefore the new building incorporated additional features to ensure the protection of operators and patients. The walls were constructed using concrete slabs containing barium sulphate and coated with barium plaster. The specially designed building opened in 1926 and was partially funded by the Edinburgh branch of the British Red Cross Society. From 1955, specialist radiography work in Edinburgh moved to the Western General Hospital, but the use of radiation in diagnosing and treating disease continues to this day in many hospitals across NHS Lothian. In common with early users of x-rays, many of the staff of the RIE Medical Electrical Department suffered cancer and injuries due to their work, giving their lives for medical advancement. Dawson Turner eventually lost 3 fingers and an eye from radiation burns he sustained. 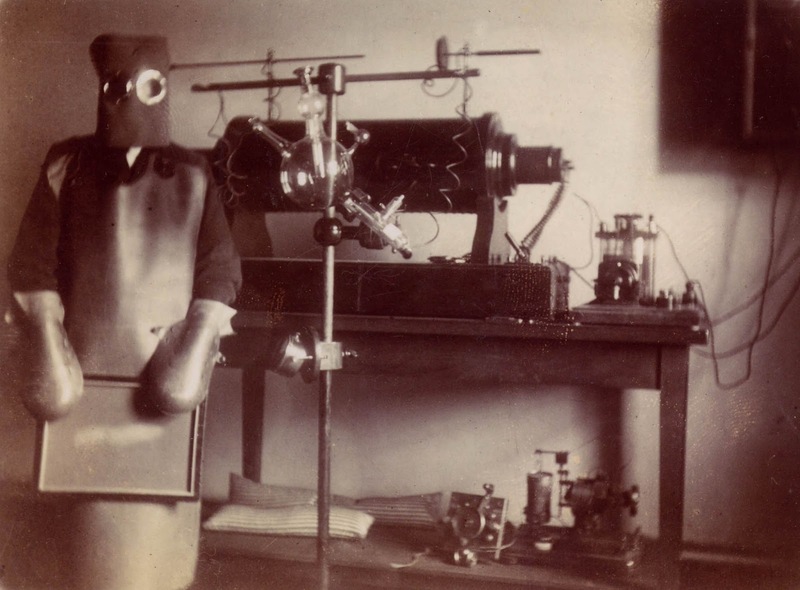 The image shows William Law, one of the first radiographers in Edinburgh, wearing full x-ray protective equipment around 1900. LHSA’s records relating to the Radiology Department include diagnostic reports found within case notes from many different specialisms, plans of the radiology building opened in 1926, inventories of equipment and School of Radiography prospectuses and application forms.